Fabien Castanier Gallery is proud to present Antimatter Series: Timeless, a solo exhibition by the Miaz Brothers. Timeless is an extension of the artists’ Antimatter Series which will once again focus on the artists’ unique form of portraiture. This exhibition will also mark the grand opening of the gallery’s second location in Bogotá, Colombia. In the “Friends” series the artists have transitioned to a monochromatic tonal palette, which pays homage to traditional black and white photography. However in contrast to photographic portraits, the Miaz Brothers venture to render an unsharpened image, a mere suggestion of the sitter’s form. 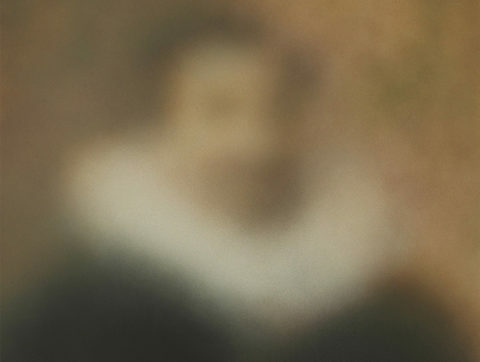 As for the “Masters” series, the artists apply the same blurred technique with muted tones of blue, green, and brown to create dark extrapolations of Renaissance portrait paintings. The brothers employ contextual titles as well as subtle changes in color and form to explore notions of perception rather than representation. The paintings are made up of a fragile haze of aerosol paint, layered to create only ideas of any human likeness and setting. By making such evasive portraits without portraying a real representation, the artists present the viewer with an exercise in memory and subjective understanding. The Miaz Brothers create paintings that defy epochs and activate the present viewer, allowing the audience to contemplate, as the artists suggest, “the transitory nature of existence”. Opening reception with the Artists Thursday, Nov 5th from 7-10pm. The show will be on view at the gallery's second location through November 28th.